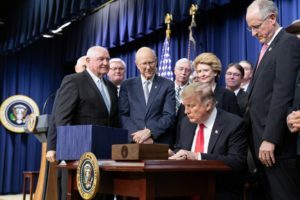 WASHINGTON – President Donald Trump today officially signed the 2018 Farm Bill, making the five-year bill a law. It’s been a difficult year for farmers and ranchers from coast to coast, but rural America is ending 2018 on a high note with this farm bill. The new law keeps crop insurance affordable and widely available for agriculture, and it provides much-needed certainty heading into 2019. President Trump and Secretary Sonny Perdue have been vocal supporters of agriculture, and they helped deliver in a big way for farmers and ranchers with this new law. Likewise, congressional leaders from both parties should be commended for their dedication in passing a bipartisan bill that provides the tools farmers need to manage their unique risks. Senators Pat Roberts (R-KS) and Debbie Stabenow (D-MI) and Congressmen Mike Conaway (R-TX) and Collin Peterson (D-MN) worked tirelessly throughout this farm bill process to make U.S. agriculture stronger. On behalf of the entire crop insurance industry and the customers we serve, thank you. Crop insurance, which is delivered by the private sector, has become a key component of U.S. farm policy. Each year, farmers spend between $3.5 and $4 billion to purchase protection on the crops they grow, ensuring taxpayers are not shouldering all the risk. When disaster strikes, insurance aid is distributed quickly to help farmers pick up the pieces and plant again. This year, 1.1 million crop insurance policies provided $106 billion in protection on more than 130 types of crops covering 311 million acres.